Darlings, you know how I love to share my little found treasures with you. 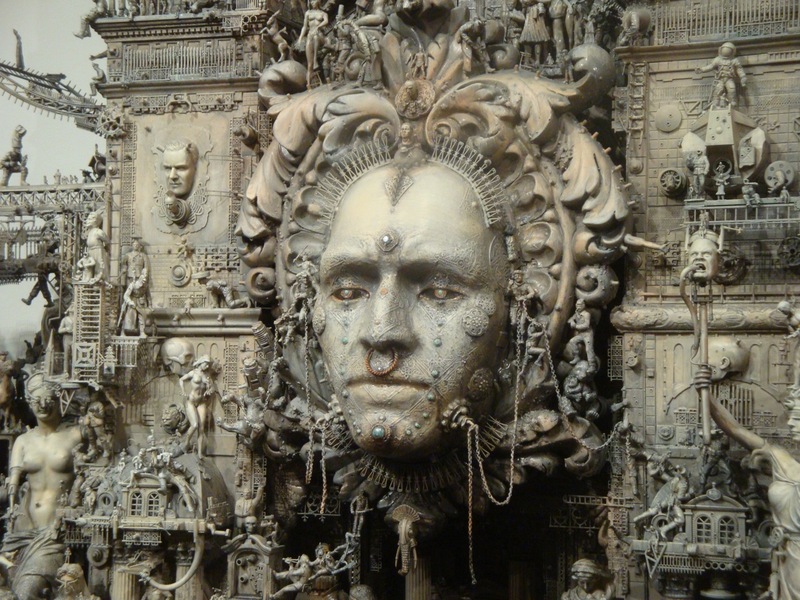 Today I offer the incredibly, darkly intricate art of Kris Kuski. Elaborate planning and building go into these intense post-industrial tableaus; figurines and faces built into a pageantry of grim upheavals, wreathed in skeletal embrace. Thank you, Le Clown. Always a pleasure to have you stop by. I can’t imagine all the time that went into these. They are just stunning pieces, thanks for sharing! Chloe, if you have a chance, take a look at the close-up photos on his site. The intricacy is jaw-dropping. I wonder how long it takes him to make these, it seems like it would be all consuming for months! Here’s a time lapse video of one of his works being assembled – amazing! There are some amazing pieces here. If I should ever get an office again in which to do my writing (this will involve us either moving or selling one/both of the children), I would love to have pretty much any of these gracing the walls. Hope all is going well for you. Easter and all that stuff. By the way, you have some great stuff at Google+. Fascinating to look around. I think I may have an account there, but haven’t done anything else with it. Of course, probably need to sell something else to afford one. ha ha… ha? Paul, glad to have you stop by and to hear that you found a few things of interest over on g+. It’s nice to have a space to share things in a real-time basis, although there is still quite a bit in the works over here on TYoH. Thanks, Mike! Welcome, and hope you stop by to visit again. Will do. Huge horror/halloween fan. Loving what you’re doing. I’m so pleased to hear it. Feel free to drop by my g+ page as well – I’m always uploading content over there when I’m not posting at TYoH. Yikes, give me a moment while I pick my jaw up off the floor! Thx for sharing this – it’s breathtaking! Why, Tamar Halloween! What a pleasure to have you drop by. Hope your Halloween planning is going well – just 200 days to go after today! I am sure it will be completely fabulous, judging from your past Halloween pictures. The detail is mind-boggling! Some seriously incredible stuff! Steve, “craft hacking on steroids” doesn’t even begin to describe it. It’s fabulous, isn’t it, Costume People? I haven’t had the pleasure of seeing any of his work in person, but I’ve been told that is even more extraordinary.